Once it was simply a bus. But now it’s a motor home. It has a bathroom with a shower, toilet and sink; a space for hairdressing, plus a small dining room and a couch. 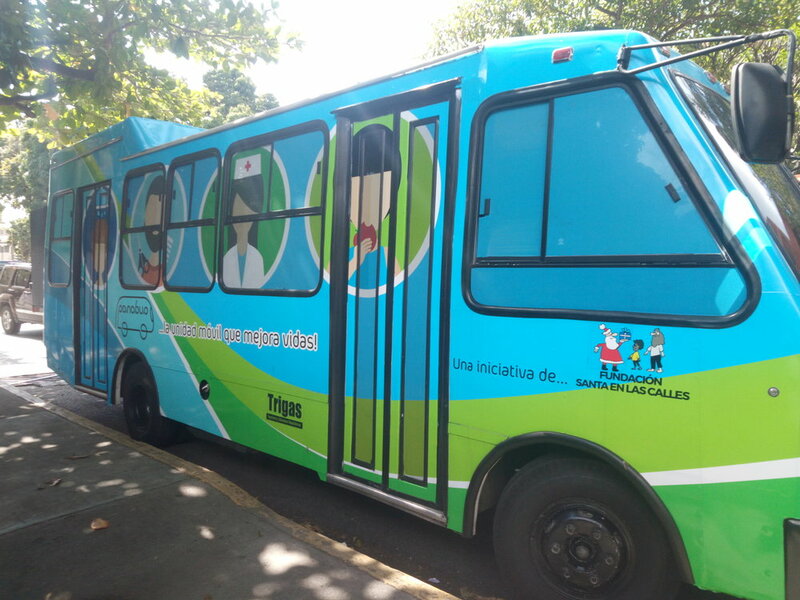 Every day it goes out on the streets of Caracas with several volunteers and specialists on board, to invite the homeless people they meet to come aboard. Those who accept receive medical attention, take a shower, brush their teeth, put on clean clothes, cut their hair and sit down to eat a hot meal. It’s called Panabus – pana, coming from the Venezuelan word for friend. It is Wednesday, Jan. 10, 10:30 a.m. and the vehicle has just crossed the Cota Mil, an expressway that crosses the city from east to west bordering the hill of Ávila. “Look, there’s one, stop!” says coordinator María Eugenia Goncalves to the driver. She points to some bushes at the edge of the road, where a man is lying on a mattress. The driver parks on the shoulder and Goncalves, a doctor, and two street mediators get off. Panabus’ street mediators are people who for years were beggars, used drugs and stole, but have rehabilitated themselves and now work with Goncalves and her team to help Caracas’ homeless. “You speak the same language as they do. I know how to reach them because I went through the same thing. I earn their trust by talking to them one-on-one … I remember when I was like that,” says Sergio Hernández, a Panabus street mediator. “Hey, brother. Good morning, how are things?” Hernández says. The man lying on the mattress immediately gets up. Gustavo takes the container. He looks skeptical – his gaze is lost, he makes a half smile. He and Hernández exchange some words, almost whispers. The others are kept at bay, respecting the moment. Hernández tells Gustavo he also slept on the street, and he wants to help him. A surprised and perhaps somewhat confused Gustavo says yes, thank you, that’s fine. And he smiles. Goncalves steps into the conversation. “No, thank you,” Gustavo says. The team boards the bus and continues their route for the day towards San Martín, a sector in the south-west of Caracas, where another six people on the street get attention. The Panabus started making rounds in November 2017, but it comes from a social project with an 11-year history. In December 2006 the De Veer family had the idea to hold an event to collect supplies for disadvantaged people. They called it “Santa in the streets”. They collected clothing, food and medicine and delivered all the proceeds to the homeless in the streets. The fundraiser was so successful they decided to repeat it every December. It was established as a foundation and the activity has been replicated in other Venezuelan cities, as well as in Peru, Aruba, Chile, Colombia, Costa Rica, Ecuador, the United States, Guatemala, England and Mexico. Venezuela has been suffering hyperinflation that has impoverished a good part of the population. The precarious living conditions of those who have less have become more acute. The De Veers felt the work of the foundation should not be limited to the traditional holiday activity. After radically transforming an Encava truck, the Panabus made its first route on Nov. 18, 2017. “The objective is to enhance the dignity of the people served and promote their reintegration into society through rehabilitation programs,” Carlos De Veer, the architect of Panabus, explains. Panabus has an alliance with the Endogenous Nucleus Simon Bolivar, a centre for people who want to leave behind life on the street. This is where Panabus recruits its street mediators. The volunteers take the opportunity to tell each other their stories, why they were on the street and what made them want to change. “We give them a road map, we insist that it is possible. We do it respectfully. We know that it can be difficult to make the decision to leave the streets, because many are stuck in addictions. We hope to have more alliances with institutions to which we can take them, because until now we only have one,” says Goncalves. The initiative is supported by donations from individuals, as well as companies inside and outside the country. With this help, the Panabus serves a maximum of seven people per day, but they hope to get new contributions so that they can reach more and more people. At the end of December, having been on the streets for little over a month, the electrical system that allowed the bus’ bathroom to work was damaged. The mishap has kept the hairdressing and grooming services limited, but it has not stopped the Panabus. “They are about to repair it very soon. It is a pity that we do not have all the services right now, but while we prefer to continue, even if we are [just] delivering the meals, we know that they need it, ” says Hernández. In three months, 150 people have boarded the Panabus. But that isn’t the greatest achievement. Among those 150 cases is one of a family that, thanks to Panabus, left the streets. Alejandra and Rubén lived as a couple in a rented room. She was pregnant. When she gave birth, they were evicted. They had no way to pay rent because Rubén, an electrician by profession, had been unemployed. With the 21-day-old baby, they slept on cartons spread out on the pavement, near a road in eastern Caracas. The Panabus saw them. Alejandra and Rubén boarded and accepted help. They explained their situation and told the volunteers on the Panabus they didn’t want to live this way anymore. Panabus brought them to the Endogenous Nucleus Simón Bolívar. There they gave Rubén a job. And there they are still, together as a family, under the same roof.